Flip Out Mama: Hot Gift: Tagsmania Baby Tag Toys! As you guys well know, I am super excited to have both a baby niece, and a baby niece due on New Years eve to buy Christmas gifts for this year! After 6+ years of nothing but boys, boys, boys, I am so happy to have a little bit of pink in my Holiday Gift Guide this year! I know when my boys were little, their favorite part of the toys (besides the boxes they came in!) Were always the tags! I just thought that they were weird, but apparently tags are all the rage with babies these days! Tagsmania is a company dedicated completely to tag toys for babies!From the original Tag Rattle and Tag Ball, they have branched out to offer some really adorable plush toys! We received the Tagacuda in pink to review for our little sweetie! This little fishie is the cutest! It is light pink with the darker pink and white tags. 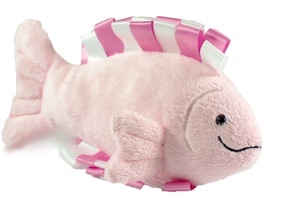 The fish itself is super soft, and will be perfect for our little angel to cuddle up with! I gave the Tagacuda to Beanie for a little test run, and of course, the first thing he did was try to eat it.. (Hey, he's a fat guy, what can I Say?!) BUT, the next thing he did, was start playing with the tags. He was really concentrating on them, moving them around and messing with them! I can't wait to see our sweet little niece have a ton of fun with this fishie! To purchase your own Tagsmania toys, click here! Make sure to follow them on Facebook and Twitter to stay up to date on all the latest and greatest from this great company! 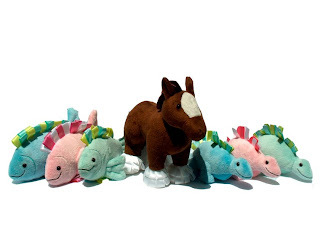 The tag toys are very cute and babies could become attached to very easily.